From the Plan Sponsor Dashboard, select Transactions then sub-selection Research All Transactions. You may begin to refine your Plan transaction search (the defaults are set to “All”) by selecting the “Investment,” “Source,” “Transactions to Display,” and “Transaction status” box options. You may also initiate a transaction search by individual Participant by entering the Participant’s social security number. It is important also to specify the “Start date” and End date” of your entries above. Search results will then appear at the bottom of the web page. 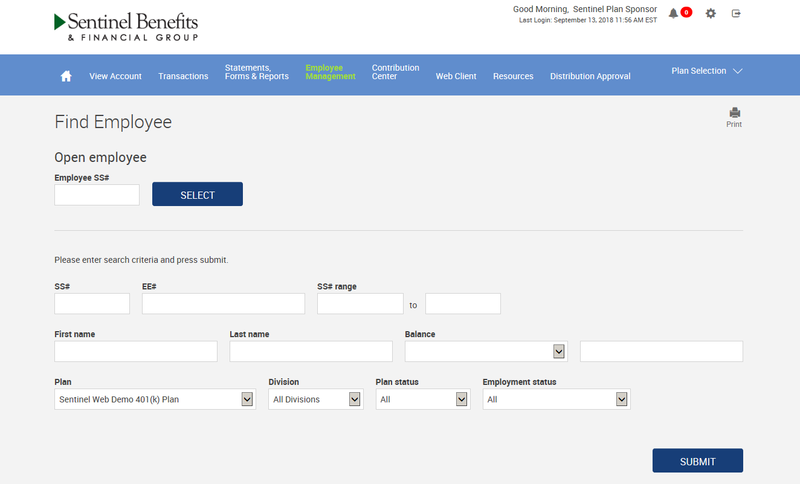 From the Plan Sponsor Dashboard, select the Employee Management tab and then sub-selection Find Employee. Select the Participant dashboard tab Manage My Account and the sub-selection View Transactions.